After the success of the first 'Tea and Tinker' sessions CC Cycles are opening their workshop for anyone to come and get their bicycles ready for Spring in the fully equipped workshop. Local cyclist Sean said; "This is a great opportunity to use the stands and tools in a clear space, and share ideas with other people. It also means you don't mess up your own kitchen!" > CC Cycles manager, Ben Wye said "We are getting busier as the weather improves so this week we are extending the workshop space to allow more people to use the facilities. All we need now is to get more people to donate their old bikes for us to renovate". Ben is passionate about making cycling more accessible and each week ensures that there is a bike cheaper than a months bus pass. "For many people, cycling is the only way they can get to work, and we want to help them as cycling is good for you, and good for Crewe. Tea and Tinker sessions run from 10 -12 on the first Saturday of every month at Christian Concern, St Paul's Centre, at the junction of Hightown and West St, at the top of the Asda car park. The Macon Way Greenway construction is due to start soon. Victoria Ave/ Coppenhall Lane traffic lights and toucans also to start soon, (both Sustrans funded with DfT). Could any 'surplus' from these be used on small improvements to the Connect2 route and better NCN signing in Nantwich? Sustrans have met the CEC at Grand Junction to discuss how pedestrians and cyclists could cross more easily. What would work for you? We are waiting on the outcome of the CEC's internal assessment of improving access for pedestrians and cyclists to Leighton Hospital. There are talks due to start about access to Crewe Station run by Mott McDonald. Integrated transport is key to linking the town with the station. What do you want? Senior Consultant prescribes cycling for health and industry. Dr. Adrian Heald: “Cycling is a big step towards a more active and healthy life”. "There is a lot that we can do to improve our fitness and cycling is one enjoyable way of keeping fit and losing calories. A local initiative at the St Paul’s Centre in Crewe combines encouragement to ride a bike with a work space where people can develop technical skills, be part of a team and build confidence after being out of work for a prolonged period." 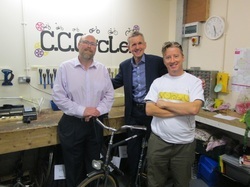 Pictured here with Ben Wye and Reverend Rob Wykes, Dr. Adrian Heald, local doctor and Labour’s prospective Parliamentary candidate said: ”The workshop for bicycle renovation at the St Paul’s Centre gives people a range of engineering and retail skills. This forms part of the bigger picture of encouraging more cycling in Crewe and Nantwich with more dedicated cycle routes and perhaps even a cycle loan scheme at the station, similar to that in Central London. Bicycles are a green and affordable means of transport. No-one is too young or too old to discover the joys of cycling, which is a big step towards a more active and healthy life for anyone who takes it up”. 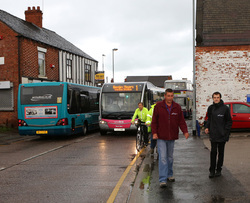 How will the £3.6m local sustainable transport grant be spent? • Objective 1 – Reduce congestion on key economic corridors which currently constrain the growth aspirations of the town. • Objective 2 – Improve accessibility to employment, apprenticeships, skills and training, particularly focused on the NW to SE corridor. • Objective 4 – Support strong communities through tackling NEET and unemployment concentrated in the NW of the town. • Objective 5 – Improve health & wellbeing by encouraging increased levels of walking and cycling for short journeys within the town. • Objective 6 – Reduce carbon emissions through modal shift and enabling low carbon travel choices. • Objective 7 – Improve safety through targeted infrastructure upgrades. 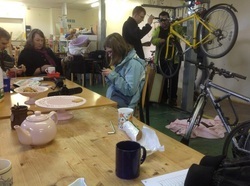 Part of this is to set up a cycle loan scheme, Wheels 2 Work (W2W). Paul Nuttall's letter in the Chronicle last week, asking to 'Get rid of car parking charges' points out that people enjoy the ambience of Crewe town centre. He links the cost of parking with its decline, but in fact, shoppers are willing to spend much more on petrol to drive miles to out of town malls that ironically are designed to replicate the calm, safe, car free shopping areas that Crewe town centre offers. The UKIP police commissioner candidate, Louise Bours wrote to ACT saying: "My family comes from Holland. When we are over there, we have the luxury of bike lanes everywhere! Wouldn't it be great to extend our bike lanes across the county?" In Dutch towns, 70% of shopping is carried out on foot, or by bike. Their model of town planning should be adopted, because research consistently proves that people shopping in UK towns on foot, by bike, or by public transport make more visits and spend more over the long term than those arriving by car. This pattern increases as large goods are often purchased on the internet or delivered. Active travellers are more likely to shop spontaneously. They are not committed to finding a parking space; if they see something (or someone) interesting, they can stop where they like. They can also stay around as long as they want at no cost. In light of changing shopping patterns, we need to turn our town centre into a place that people want to be in. The Portas review of town centres says that “busy roads, can make high streets unsafe for shopping...we need to offer a safe and pleasant place to shop and socialise.” Making it cheaper and easier to park in town centres will inevitably result in the opposite – busy, dangerous and polluted. We need to be more creative rather than focusing on parking. Other town centre stores have all weather cycle racks, urban lockers for on-foot and on-bike pick-ups, and are responding to ‘click and collect’ retail by facilitating new ways to accommodate shoppers. If more trips into Crewe are by bike, or by foot, the town will become an attractive place where people will want to be, and everyone will benefit. Thanks to Bikebiz.com for this: Cycling and walking to benefit from creation of a new cross-departmental Government body with an initial budget of £1bn. The Government's response to the Get Britain Cycling report has been less than effusive so far, but perhaps ministers are keeping their powder dry for the expected launch of a new cross-departmental body that could be announced in June. BikeBiz has learned that the new organisation may be called OAT, the Office for Active Travel. It will have an initial budget of +£1bn and has won favour with the Treasury because it could start delivering capital projects almost immediately. There are many "shovel ready" projects waiting in the wings from local authorities, and some of these could be quickly given the go-ahead by OAT. These projects include pedestrian and cycle infrastructure projects. OAT would be cross-departmental, not just a responsibility of the Department for Transport. This is a recognition that walking and cycling are much more than just modes of transport. And OAT is politically uncontroversial, likely to get support from Labour, too. Crewe was visited by the leader of the Labour party today as part of the ‘One Nation’ campaign. Ed Milliband spoke to a large crowd at Pickmere Court residential home, answering a range of open questions from local people. I asked if it was the government’s job to encourage people, especially young ones, to travel actively. Ed Milliband spoke about health and obesity. He said everyone, especially schools, should encourage people to keep fit, saying 'I would really encourage your campaign". However when asked about school travel, he said we should encourage active travel but it was ultimately the parent's decision about how their children should get to school. The Labour candidate for Crewe, Adrian Heald said it was terribly important to do at least half an hour exercise a day to avoid co-morbidity problems, such as heart disease and diabetes. As part of a future health programme, we have to be able to intervene to empower the thousands of people in this constituency to live in a healthy way and to lose weight. Labour wants a creative, integrated and innovative response by local health authorities, businesses and universities to help the local population to make healthier choices that will benefit them in the future, and reduce the burden of ill health that we will face if we don’t address the issue in the coming decades. “It has made me think more when I’m riding my bike”. The letter in last week's Chronicle (Pathways are an Expensive Folly) reflects the importance of high quality building to promote active travel, in a week when the coalition government demonstrated that investment in infrastructure was crucial for economic recovery. Last week, an all party parliamentary panel discussed the business case of committing to a national programme of infrastructure for cycling. Research presented to the panel showed that the single, most efficient way to do this was to build segregated cycle lanes that would encourage more people to travel actively. This in turn has the added benefit of reducing road congestion, accidents and damage costs. The Transport and Health ministers agreed that from April, councils will be able to invest their new health budgets in promoting walking and cycling, to counter the £4 billion cost of inactivity and obesity. Meanwhile, the World Economic Forum in Davos agreed that "the financial costs linked to climate change represent the biggest threat to global economy." The Nobel Prize winning economist, Joseph Stiglitz argued that we need to invest in 'green' projects; "It will be expensive but it will be an investment that will help to stimulate the economy and it will provide long-term economic development." The letter writer is correct that the high quality walking and cycling link between Crewe and Nantwich is 'Big Lottery' funded, but that a lot of the funding came from Sustrans, which is a national charity. The council involvement was agreed at a public vote in 2007. As a fellow taxpayer living in Wistaston, I believe that Connect2 will provide a quick, safe link to the high speed national rail network, while maintaining the greenness of the Gap. I agree with the writer's call for an investigation into funding any similar project that might help us, and our children, all become healthier and wealthier, long into the future. The two main stories in this week's Chronicle (26 December) highlight why we all need to consider travelling more actively this year. The growing congestion at the retail park and surrounding roads was caused by customers choosing to drive. A choice driven by poorly designed cycle paths, dangerous pedestrian access, and hardly any cycle racks. The 'outrage' at the cutting of the school bus service from Willaston to Nantwich which completely ignores the option of a 15 minute cycle to school, which is faster than the current bus ride. Walking or cycling to shops and schools can be a realistic choice for most of us, given a fairer sharing of roads and resources. Currently active travel gets less than 1% of transport funding to make our roads places where we feel safe and confident out of our vehicles. Public health guidance 41 from NICE shows how the health benefits of active travel outweighs the risks. Schools cannot provide the exercise our children need, but creative longer term transport planning will improve the health of all of us by providing safer routes, training and facilities to match those that cars enjoy. But it is each of us that have to choose to be lean and green in 2013. The incentive of Mr John Weir and Nantwich’s Local Area Partnership (LAP) to increase trade in the town is to be applauded. [Chronicle 21 November]. However, with fuel at almost at £7 per gallon, the thought that saving a few pence to park a car will encourage more people to shop in the town seems odd. In fact, encouraging car use would be a major disincentive to shop in Nantwich because at busy periods the town becomes grid locked with motorists all competing for the same parking space. Research has shown that pedestrians and cyclists spend more in the local community, because they’re not distracted by traffic or trying to find a place to park, and neither are they constantly looking at their watches worried if their parking tickets are about to expire. If something catches their eye in a shop window, they don’t have to worry about parking- they simply go into the shop. With over 95% of all residents of Nantwich living within a 1 mile radius of the town centre, i.e. a 15 minute walk or 5 minute bike ride, we propose that Mr Weir and the Nantwich LAP might come with an incentive to encourage people to leave their cars at home, rather than restricting overall trade by exacerbating the chronic Christmas congestion. Not only will Nantwich traders benefit, but it would give us all a safer, healthier and more prosperous place to live. And who doesn’t want that?